When judging the success of any screening programme, two statistical measures need to be considered: sensitivity and specificity. But what are these parameters and what light do they shed on the current debate on screening for breast cancer? In any binary classification test, there are four possible outcomes: true positive; true negative; false positive; and false negative. Sensitivity measures the proportion of true positives that are correctly identified: the percentage of women with breast cancer who are actually diagnosed as having the condition. Specificity measures the proportion of true negatives: the percentage of healthy women who are correctly identified as not having breast cancer. The optimal breast screening system would have 100% sensitivity and 100% specificity but such a system does not yet exist. Mammography, for example, typically yields values of 75% for sensitivity and 90% for specificity. 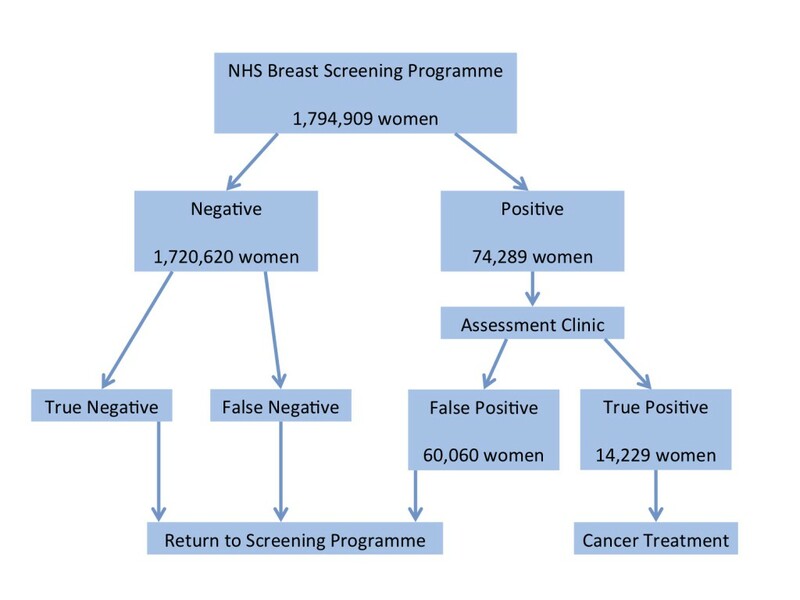 CapeRay recently analysed the cost implications of misdiagnosis for the breast screening programme of the National Health Service (NHS) in England. As seen in the diagram below, almost two million women were assessed in 2010 at a total cost of £75 million. Of these women, 74,289 were diagnosed as “positive” and asked to return to the clinic for evaluation. There they underwent further X-rays and ultrasound and, in some cases, a needle biopsy. Only 20% were found to have a malignant lesion (i.e. true positive) that meant about 60,000 women were subjected to “unnecessary” procedures and psychological trauma. Since the average assessment cost was £153, the total cost of false positives was a little more than £9m. There were more than 1.7 million women diagnosed as “negative” and sent home to await their next invitation, in two years’ time, to return for another mammogram. But how many of these women were false negatives, sent home with a rapidly growing breast cancer that would soon metastasize? Since one third of them had dense breasts, and ultrasound can detect cancer in an additional 4 women per thousand screened, we estimated there were 2,262 women whose cancer was missed. Since the difference in treating early versus late stage breast cancer is almost £28,000, the potential savings to the NHS in eliminating false negatives would be £63m per annum. While the financial benefits of a better screening system are clear – the NHS costs would be matched by savings – it is the women of the UK who would be the real winners.